Ohhhh!! What an Eye Opener! 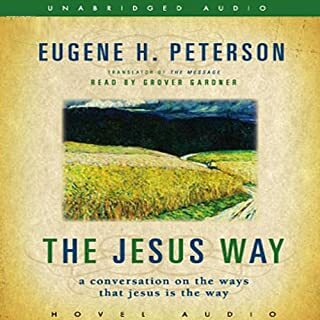 Eugene H. Peterson considers all the ways that Jesus is the Way compared to the distorted ways the modern American church has chosen to follow. 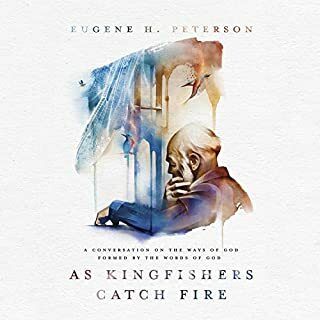 Arguing that the way Jesus leads and the way we follow are symbiotic, Peterson begins with an extensive study of how the ways of those who came before Christ - Abraham, Moses, David, Elijah, Isaiah of Jerusalem, and Isaiah of the Exile - revealed and prepared the "way of the Lord" that became complete in Jesus. Excellent narration of a challenging book. 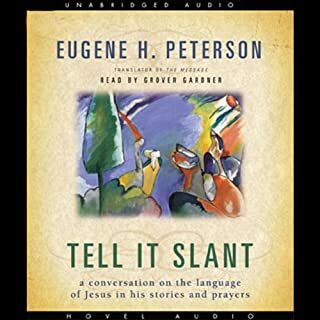 Peterson's Tell It Slant promises to deepen our understanding of Jesus' words, strengthen our awareness of language as a gift of God, and nurture our efforts to make all of our speech convey a blessing to others. 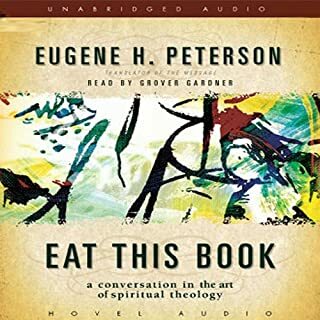 Writing in the conversational style that he is well known for, Peterson boldly sweeps out the misunderstandings that clutter conversations on spiritual theology and refurnishes the subject only with what is essential. As Peterson shows, spiritual theology, in order to be at once biblical and meaningful, must remain sensitive to ordinary life, present the Christian gospel, follow the narrative of Scripture, and be rooted in the "fear of the Lord" - in short, spiritual theology must be about God and not about us. 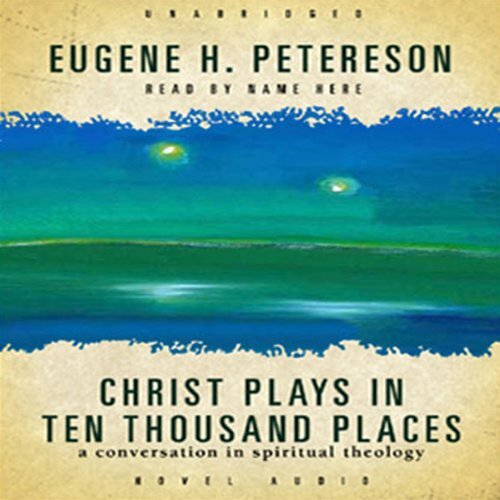 The foundational work in a five-volume series on spiritual theology emerging from Peterson's pen, Christ Plays in Ten Thousand Places provides the conceptual and directional help we all need to live the Christian gospel well and maturely in the conditions that prevail in the church and world today. Thoughtful and detailed, with special attention to the nuances and shades of meaning in the words of Scripture discussed Would we expect any less from the man who turned the entire Bible into an enormous poem? I'm stopping at four stars, not five, because the emotional affect of this book was a little... muted. It was a beautiful commentary; insightful and interesting. 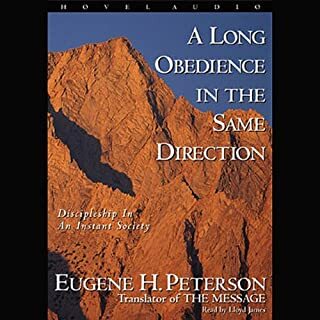 But for a book largely on the topic of "everyday life lived out in community", Peterson's text was not actually all that practical, and while the scriptural commentary taught me many things I hadn't known or considered before, it lacked that delicious "aha" feeling of discovery or of total perspective shift. 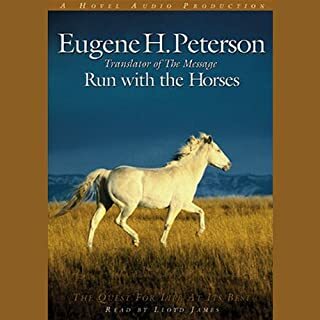 Apart from the deeply inspirational content of the book, Grover Gardner is among the top five narrators I've ever heard. I'm hoping for a Whisper-Sync version of this book. I already have the Kindle edition, but they aren't synched. To simulate synching, I would have to listen on one device while turning pages in the Kindle app on another. Well written and deep. Enlightening. I had to keep going back to get the insight. They come fast and furious. Starts slow but ends with a bang.